Banjo tailpieces come in a lot of different varieties. They can be divided roughly into two groups: tailpieces which allow for adjustment and those that don’t. The No-Knot banjo tailpiece is perhaps the most common today. It is a favorite with me as it offers a way to hook it onto the end pin nut, a plate to keep the strings off the tension hoop, and five little knobs to hook the strings over. Simple and good! An adjustable angle banjo tailpiece can be nice too. 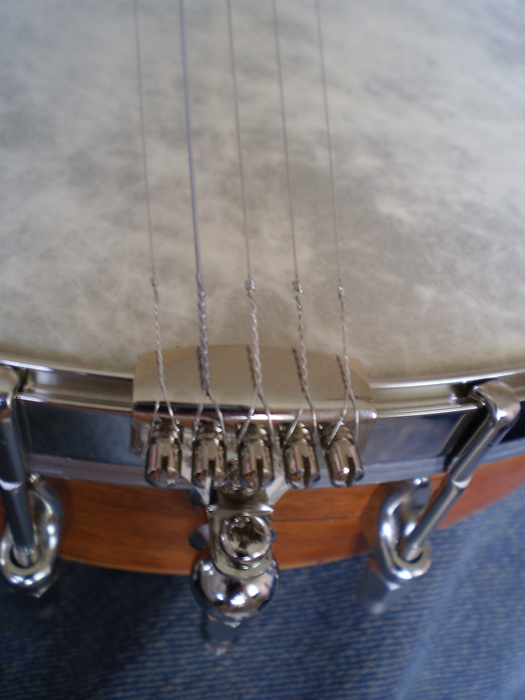 They have a metal plate that protrudes over the banjo head and an adjustment screw, together they create the option of adjusting the angle of the strings over the bridge. Sharpening the angle across the bridge puts more string pressure on the head. 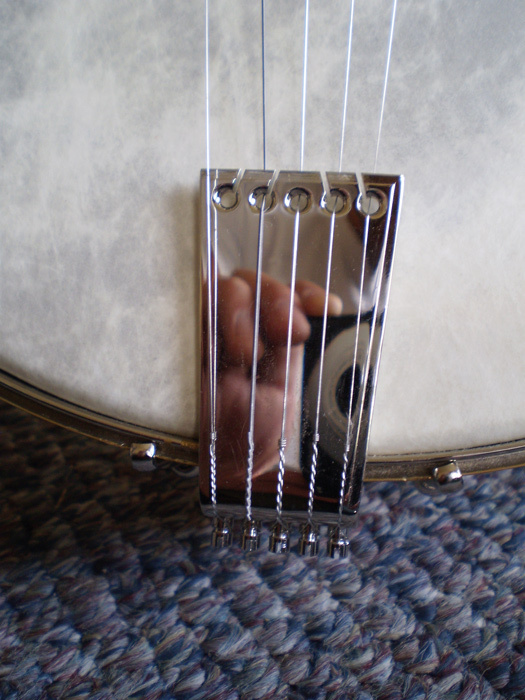 An adjustable angle tailpiece can be a nice upgrade for banjos that lack volume. I think they may have a little less tonal ring than the no-knots. They also offer the chance to “dress up” a banjo a little. The tension hoop holds the head on and gives the hooks something to grab onto. Most tension hoops are made from brass. A lot of them are plated with nickel. There are two basic kinds of tension hoops: grooved and notched. The grooved type has a groove that runs around the top edge of the hoop, flat hooks are used with this type of hoop. The other kind is a notched hoop which has notches for the hooks already cut into it. This means that the number of hooks and their spacing is already defined, so you have to work to that when you drill the rim for shoes. Round hooks are typically used with the notched hoop. I prefer the grooved hoop. It allows for different hook arrangements and does not poke my arm as much as the notched hoop when playing the banjo. It is also much more forgiving of a shoe bolt hole that is slightly out of place.